MHG Heating has supplied 74 bespoke Teleheat heat interface units (HIUs) to The Priory retirement/sheltered housing development in Berkshire. The Teleheat units were specified by M&E contractors IDC Southern, working on behalf of main contractor Leadbitter Construction. Operated by the Sovereign Housing Association, The Priory was completed in 2013 and consists of two curved apartment buildings in a crescent-shaped street. 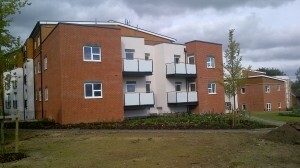 The first building offers 46 one- and two-bedroom extra care apartments, while the second building provides 28 homes specifically designed for people over 55. Energy efficiency was a key element of the building design, helping to minimise energy costs for tenants while also reducing Sovereign Housing’s environmental impact. In support of this, the buildings are supplied by a district heating network served from a central plant room. Base heat loads are met by combined heat and power (CHP) plant, supplemented by two gas-fired condensing boilers for peak loads. Hot water is supplied to a Teleheat HIU in each apartment, providing precise control of five underfloor heating zones and domestic hot water services. MHG customised the Teleheat units to meet IDC’s specific requirements. “For ease of installation we wanted HIUs with top-entry, rather than the standard bottom-entry,” recalled IDC’s Tony Wright. “We spoke to a number of suppliers but MHG was the only one prepared to modify their units in this way. They also fitted heat and water meters in the units to provide Sovereign with centralised monitoring and billing facilities,” he added. MHG’s Teleheat HIUs incorporate integral electronic controller, temperature sensors, mixing valve and circulating pump to ensure accurate temperature monitoring. There is also a hot water pre-heat function for instantaneous DHW in the summer when space heating demands are low. Other design features include hot water priority, gradual warm-up for the heating circuit and a pump and valve exercise program to reduce standstill seizure.